Definition: Organizational Conflict or otherwise known as workplace conflict, is described as the state of disagreement or misunderstanding, resulting from the actual or perceived dissent of needs, beliefs, resources and relationship between the members of the organization. At the workplace, whenever, two or more persons interact, conflict occurs when opinions with respect to any task or decision are in contradiction. In simple terms, organizational conflict alludes to the result of human interaction, that starts when one member of the organization discerns that his/her goals, values or attitude are incompatible, with those of other members of the organization. The incompatibility in opinions can come into being, within a member, between two members, or between groups of the organization. Unclear Responsibility: If there is lack of clarity, regarding who is responsible for which section of a task or project, conflict takes place. And, to avoid this situation, the roles and responsibility of the team members should be stated clearly and also agreed upon by all. Interpersonal Relationship: Every member of an organization, possesses different personality, which plays a crucial role in resolving conflict in an organization. Conflicts at the workplace, are often caused by interpersonal issues between the members of the organization. Scarcity of Resources: One of the main reason for occurence of conflict in an organization is the inadequacy of resources like time, money, materials etc. due to which members of the organization compete with each other, leading to conflict between them. Conflict of Interest: When there is a disorientation between the personal goals of the individual and the goals of the organization, conflict of interest arises, as the individual may fight for his personal goals, which hinders the overall success of the project. Conflicts alleviate at the workplace due to individual and inter-individual factors. Individual related causes entails attitudes, beliefs, personality orientation and human-frailties. Inter-individual conflicts arises when a manager breaches norms of the organization. Relationship Conflict: The conflict arising out of interpersonal tension among employees, which is concerned with the relationship intrinsically, not the project at hand. 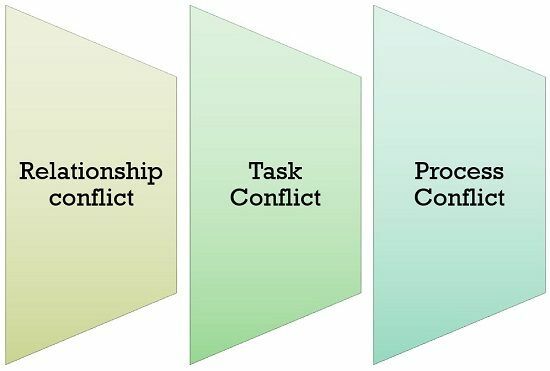 Process Conflict: Clashes among the team members due to the difference in opinions, on how work should be completed, is called process conflict. Organizational conflict can also be personal conflict (one that exist between two people because of mutual dislike), intragroup conflict (one arising out of lack of liberty, resource, etc. in a group) and intergroup conflict (one that exist between two groups). Managerial Expectations: Every employee is expected to meet the targets, imposed by his/her superior and when these expectations are misunderstood or not fulfilled within the stipulated time, conflicts arises. Communication Disruption: One of the major cause of conflict at the workplace is disruption in the communication, i.e. if one employee requires certain information from another, who does not respond properly, conflict sparks in the organization. Misunderstanding: Misunderstanding of information, can also alleviate dispute in organization, in the sense that if one person misinterpret some information, it can lead to series of conflicts. Lack of accounhtability: If in a project, responsibilities are not clear and some mistake has arisen, of which no member of the team wants to take responsibility can also become a cause of conflict in the organization. The causes of organizational conflict are to be known, to resolve them as early as possible, because it hinders the efficiency, effectiveness and productivity of the employees and the organization as well, which ultimately hampers its success. Formation of official grievance procedure for all members. Concentrate on the causes rather than their effect, to assess conflicts. Parties to conflicts should be given an equal voice, irrespective of their position, term or political influence. Active participation of all the parties to conflict can also help to counter it. In an organization, conflict is inevitable and so various means are to be discovered to resolve them or use them in a way that can help the organization to increase its productivity.